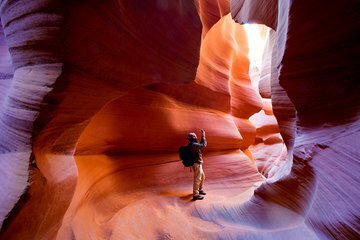 Experimente o melhor do deserto do sudoeste com uma excursão de 3 dias de Las Vegas a Sedona, Monument Valley e Antelope Canyon. Atravesse o cénico Mojave e contemple as vistas a partir do Planalto do Colorado enquanto viaja pela histórica Route 66 através da paisagem rochosa. 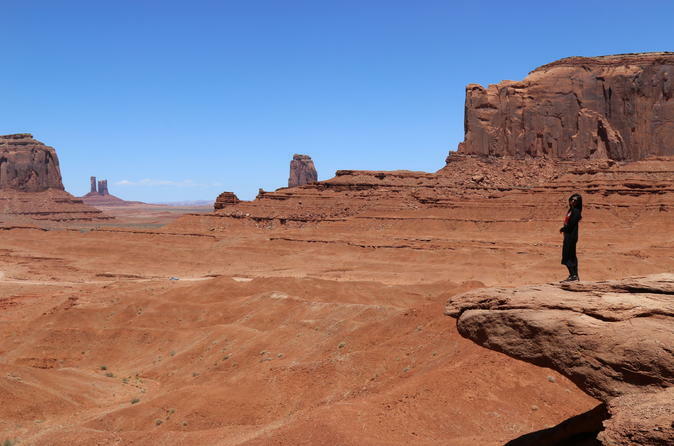 Explore as crescentes formações de Sedona e as boutiques do centro da cidade, depois mergulhe fundo na nação Navajo com um passeio de jipe pelo Monument Valley. Assista à corrida do Rio Colorado através da Horseshoe Bend, veja a luz da noite no Lago Powell e visite as imponentes dunas e falésias de arenito nos parques perto de Las Vegas. Yes Recommended. Nice tour, My Mom and I enjoy the tour. Driver and tour guide were friendly. Well organized trip. Bravi Grazie! Ottimo Tour, ben organizzato, il viaggio in pulman è ideale per assestarsi con il fuso. The first day was all wrong. Instead of 15 people on the bus, it was 21 driver. It was not cooler with water, one of the tour guide bought box of water and it got very warm very fast. We didn't visit places what we suppose to visit because the tour busses wasn't allow there. First night hotel was ok, but continental breakfast was very poor quality. Second nigh rooms were good and breakfast was very good. It was not much of the guidance during the trip and I was looking for information about places we visit on line. I would not recommend it to my friend. It was ok, and it could be much better. It was an amazing experience of this three days tour. Everything was perfect. only one recommendation, if u can extend the tour one day more to include Zion and Bryce Canyon, it will be a perfect tour to see the region. The best and the go to tour from Vegas. Perfect organization! Congratulations to the guides Mr. Stefano Galli and Mrs. Ingrid Hinkelmann for their kindness and preparation. Spring time was the perfect period for this visit. Thank you/ Grazie! Perfect organization! Guides Mr. Stefano Galli and Mrs. Ingrid Hinkelmann were very prepared, kind and professional. Spring break is really a great season to visit these places. Thank you again. Grazie! This was an amazing trip Our guide Ingrid was informative and excellent always trying her best to ensure we have the best experience. the countryside didn't disappoint and the meal with the Navajo in spectacular countryside was memorable. I have had other short tours and this had no hidden costs, and the hotels were of good standard. Great tour! Friendly driver and tour guides. The places that you visit are beautiful. The hotels were nice and calm, so you could get a good sleep. This was an amazing tour and the guide was great. Accommodation was comfortable, the bus was also very comfortable. We had a very friendly group, and everyone seemed to get along. I felt it was a great way to visit the sites listed, I felt that our time a the valley of fire was a little rushed, however its one of those places where there are endless things to explore and I understand you cant see it all! I would recommend this tour!! thanks.